Pin and Paper: A Halloween Graveyard Terrarium, or, Are two spinal columns considered overkill? A Halloween Graveyard Terrarium, or, Are two spinal columns considered overkill? I love terrariums, I love Halloween, and I love miniature dioramas. Never have all three of these things come together so well, as in this graveyard mini terrarium display. I wish I had come up with the concept myself, but I got the idea from silvia-chenault.blogspot.com. I've included the link here, but as of the time of this post, her blog has been removed. However, I must give credit where credit is due for her great idea. First, prepare your skeletons by hacking them to peices with a pair of scissors. Then cut out some headstone shapes. I just used some heavy cardboard pieces that I had lying around, but you could use small scraps of wood or whatever you have on hand. Paint your headstones to look old and moss covered. I just used regular acrylic craft paint. Then assemble your terrarium/diorama/morbid graveyard scene. 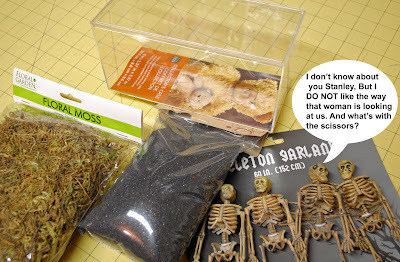 Pour black sand in the bottom to simulate the dirt, add in your various skeleton pieces, your headstones and cover with moss. I felt I needed some height in mine so I gathered some twigs out of the backyard and painted them black really quick with a few quick squirts of spray paint, then I stuck them in the sand to look like an old dead tree. I played around a lot with placement. It's a fine line between, "artistic decomposing human remains" and "gory gratuity". One extra ribcage could mean the difference between art and excess. I'm happy with it for now but plan on perhaps adding a rickety wrought iron graveyard fence by cutting one out of black cardstock and putting it up against the back of the container. Maybe I'll add some faux cobwebs in the tree or a shifty eyed little raven. 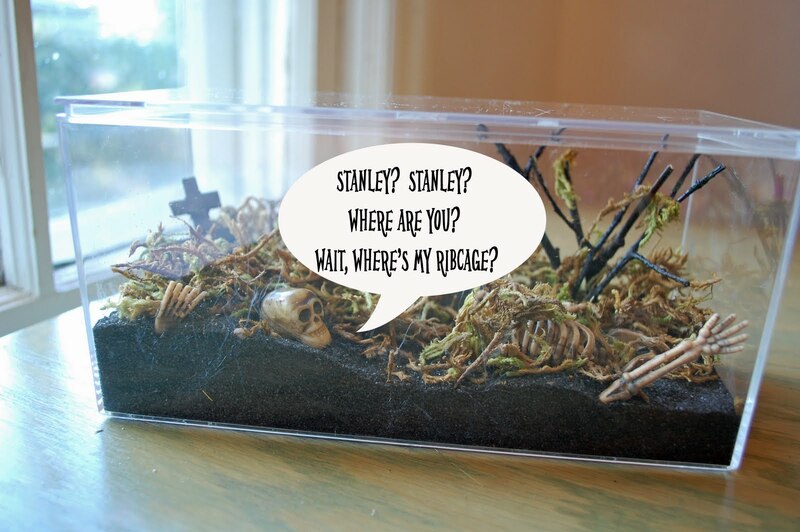 I had toyed with the idea of making it an actual live terrarium, but didn't want to go to the trouble of finding headstone options that would withstand the moisture, but considering I usually kill live terrariums anyway, it probably would have been a great effect! I hope this inspires you to create your own mini vessel of rot and senseless Halloween gore. Mother, crafter, knitter, reader, writer, procrastinator. Sarcastic, self-depricating, exhausted yet inspired.